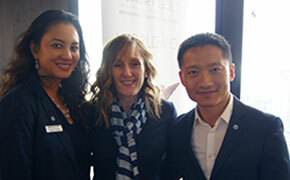 Insight Canada VP Sales Carla Brake is flanked by Marie Anne MacRae, VP Global Strategic Partnerships for The Travel Corporation and Winston Ma, PR & Digital Marketing Specialist, The Travel Corporation. 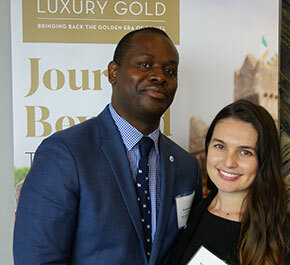 The Travel Corporation Canada Director of Operations DuWayne Moore with Bianca Texeira, Digital Content & Media Specialist, The Travel Corporation. 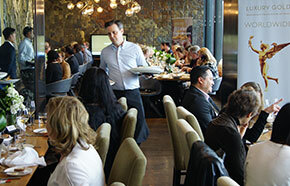 Toronto’s famed Canoe was an appropriate location to promote Insight’s deliciously authentic dining. The Travel Corporation CEO Brett Tollman (left) with Carla Brake and Insight Vacations Canada President Brad Ford. 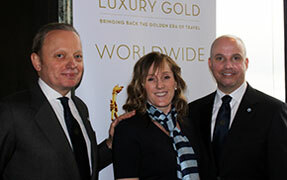 Insight Vacations Canada’s recently appointed President Brad Ford says Luxury Gold lives up to its billing. Ford recounted the thrills of having a private viewing of Michelangelo’s David at the Galleria dell'Accademia in Florence and visiting the Sistine Chapel with a small Insight group. Ford says every Insight and Luxury Gold tour includes amazing experiences like meeting with an olive grower and enjoying a Tuscan lunch, learning about apple cider making next to a Norwegian fjord or tasting oysters as they come out of the sea on a fishing barge off the Croatian coast. Every Insight journey includes a variety of authentic ‘included experiences,’ including the eight new multi-country ‘Discovery’ journeys featured in the Insight Vacations Europe 2018 brochure. The fast-growing Luxury Gold brochure is designed as a ‘lifestyle magalogue’ and features nine new VIP itineraries, including trips that reveal the ancient heritage of Japan, the natural wonders of Scandinavia and the ecological gems of Costa Rica. 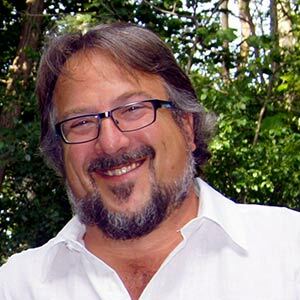 On Chairman’s Collection trips, Insight guests have the opportunity to dine with an Italian Count in his Tuscan Villa, be toured through castle gardens by a British Duchess or enjoy a drinks reception at Artstetten Castle hosted by a Princess who’s a direct descendant of Maria Theresa and Archduke Franz Ferdinand. Dining is an important part of any trip, and with Insight it’s a centrepiece. Every Luxury Gold trip features a Michelin-starred restaurant for a lunch or dinner. Every Country Roads itinerary includes a farm-to-table experience that shows of the best ingredients of the region. There are dine-around evenings where guests can indulge their preferences through a choice of restaurants. And, in a new partnership with VizEat, Insight offers dine-at-home experiences with locals in several cities.